Coastal Georgia Historical Society offers a wide range of programs and activities throughout the year and strives to be a center for educational and cultural excellence in our community. There are three membership meetings held annually, in the winter, spring, and fall. Each meeting features a short report given by the Executive Director to Society Members followed by a lecture from a special guest speaker. The largest of these meetings is the Society’s Annual Meeting, held in January in The Cloister Ballroom on Sea Island, where upwards of 300 members gather to honor recipients of the past year’s annual awards and learn from world-renowned scholars. Past keynote speakers of membership meetings have included Dean Norton, Director of Horticulture at Mount Vernon; Libby O’Connell, History Channel’s Chief Historian; and Richard Brookhiser, noted biographer of America’s founding fathers. Buddy Sullivan, the Society’s Senior Historian, presents a six-week overview of the history of Georgia’s barrier islands and the adjoining mainland. The annual course takes place January through February and chronologically traces Georgia’s coastal history from Native American culture through 20th century events, including World War II. While covering the coast from Savannah to St. Marys, the focus of the lecture series is on St. Simons, Jekyll, and Brunswick. Sullivan has conducted this popular winter series for Coastal Georgia Historical Society since 1995. The annual Journeys series aims to take our membership on trips through local history, both literally and figuratively, as it combines an educational program with an expert-led field trip on a similar topic. For the 2018 Journeys event, Society members took a field trip to Cumberland Island with guided tours of Plum Orchard, Sea Camp, and Dungeness. The Chautauqua Lecture Series features four lectures held once a week in late summer and based on a theme related to Coastal Georgia history. The series has recently included topics such as American icons of the 1920s with Coastal Georgia connections, architectural heritage of the Golden Isles, and the Civil War. The 2015 lecture series, in celebration of the Society’s 50th anniversary, focused on the iconic St. Simons Lighthouse and related lighthouse history. To view the 2018 lectures, visit this page. Thank you to Wells Fargo Advisors for sponsoring the Chautauqua Lecture Series since 2011. The Society has offered Friday Fun Days at the St. Simons Lighthouse Museum with activities designed for family fun to encourage local families to visit the museum during the summer months. Since 1998, the Little Light Music Concert Series has taken place on the Lighthouse grounds. This five-part concert series is held in the spring and summer and attracts over 5,000 visitors. Concerts feature local and regional talent, with an audience consisting of locals as well as tourists, many of whom are return participants. Concert-goers are encouraged to bring picnics to enjoy on the lawn. Thank you to Brown-Rose Wealth Management of Morgan Stanley, Elegant Island Living, Moore Stephens Tiller, Parker’s Convenience Stores, Sea Island Landscaping, Sea Island Properties for sponsoring the 2018 Little Light Music Concert Series. For one Saturday every November the Society offers free admission to our museums. The day includes a festival of events at the Lighthouse celebrating the heritage of the Golden Isles. This event allows local residents who have lived in Glynn County for years without ever visiting our island and our museum the opportunity to come and enjoy some of the Golden Isles’ most iconic landmarks free of charge. Thank you Zach Powell, DMD, of the Dentistry in Redfern for sponsoring Community Day in 2016 and 2017. The Society will not have Community Day in 2018. In the fall and winter, in conjunction with the St. Simons Land Trust, we have offered in-depth history tours of Cannon’s Point Preserve. Archaeology consultant Myrna Crook provides a detailed interpretation of the historic site, including the John Couper family and life at Cannon’s Point during the plantation period. 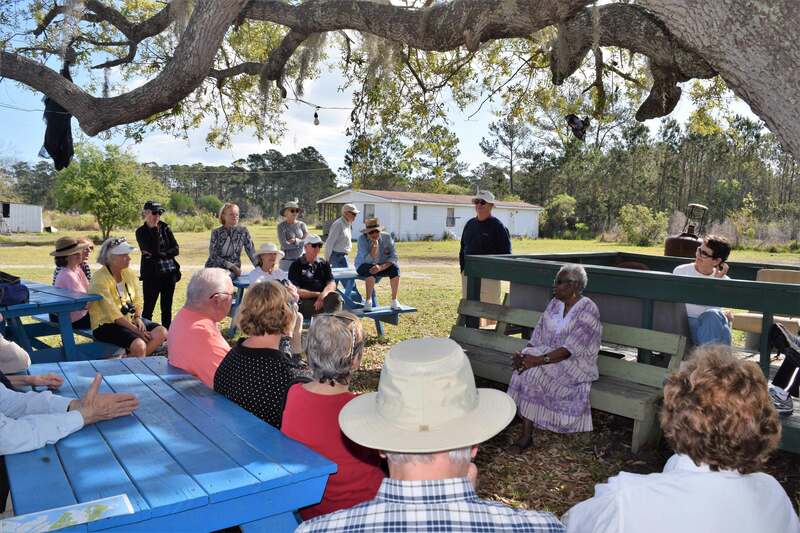 The Society has offered tours, led by local expert Amy Roberts, examining the history of the African American experience on St. Simons Island. Tours were generally offered in February, in celebration of Black History Month. To register for current events, visit our Program Registration page.